The husband and wife terrorists in San Bernardino were shot by police more than 40 times combined after their 2015 shooting rampage, according to a new report issued by the county’s district attorney’s office on Thursday. The 55-page report detailed accounts of nearly two dozen law enforcement officers who were able to take down Syed Rizwan Farook and his wife Tashfeen Malik. The report explains how police located the attackers and the evidence collected after they were killed. Police identifed Farook after interviewing a co-worker who said the masked man that entered the Inland Regional Center had his same stature and body shape. Officers learned that Farook had rented a black SUV, which matched the description as the assailant’s car, according to the report. Officers pursuing the couple in their getaway SUV were shot at while attempting to pull them over. Farook eventually stopped the car on a residential street, police said. Farook exited the vehicle and fired at police with a Smith & Wesson M&P15 semi-automatic rifle. One San Bernardino officer recalled shooting Farook five or six times during the firefight. “One of the rounds passed through Farook causing a mist of blood on impact,” the report said. “Farook fell to the ground but was still moving.” Farook was still clutching his rifle when he was shot two more times. FILE – In this Dec. 2, 2015, file image, taken from video, armored vehicles surround an SUV following a shootout in San Bernardino, Calif.
As Farook lay dying, his wife was ducked behind a backseat in the SUV. Officers said it seemed like she had been “blindly firing towards the officers rather than taking aim.” She was dressed in all black, carrying an AR-15 semi-automatic rifle and was wearing a load-bearing vest with several spare rifle and pistol magazines, along with an airsoft neck protector and black safety glasses. Autopsies found that Farook was shot 27 times and Malik was shot at least 15 times. In total, the couple fired about 80 rounds from rifles and one bullet from a handgun. Officers fired 440 rounds from rifles, shotguns and handguns. Several nearby homes and cars were struck by bullets, but no civilians were hit during the shootout. 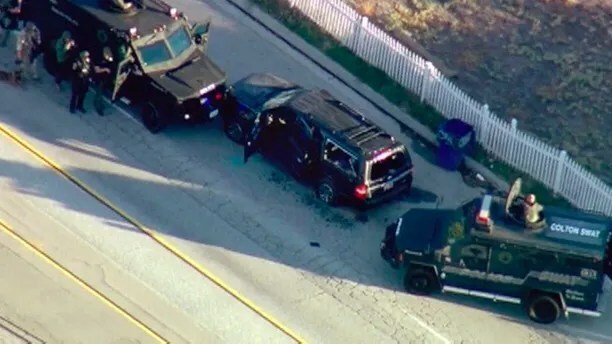 Police scouring the SUV found a black backpack with 14 rifle and pistol magazines, a military-style ammunition container with 870 rifle cartridges that were loaded into 10-round clips, along with three rifle sighting systems and several bags filled with hundreds of ammunition cartridges. According to the Riverside Press-Enterprise, the attorney’s office said the officers’ killing of the terrorists was justified. District Attorney Mike Ramos called the officers’ actions courageous.